The peninsula has never been Ukrainian, said a French presidential candidate. The leader of the populist National Front and French presidential candidate, Marine Le Pen, has once again promised to recognize Crimea as part of Russia. "Yes, after the referendum, which showed the consent of the people to join Russia, I also recognize Crimea part of Russia. The transfer of Crimea to Ukraine was only an administrative matter back in the Soviet times. The peninsula was never Ukrainian," Le Pen said in an interview with the Russian daily Izvestia on 16 January. "I regret that the referendum organized to demonstrate the will of the people of the peninsula was not accepted by the international community and the United Nations," Le Pen said. On 3 January, Le Pen said that Russia's annexation of Crimea was not illegal. This statement evoked a strong response from Kyiv. The Ukrainian authorities said Le Pen could be denied entry over these remarks. In 2014, Le Pen was reported to secure a 9m euro loan to finance her campaign from the First Czech-Russian Bank. Marine Le Pen is seen as one of the most popular presidential candidates in France. 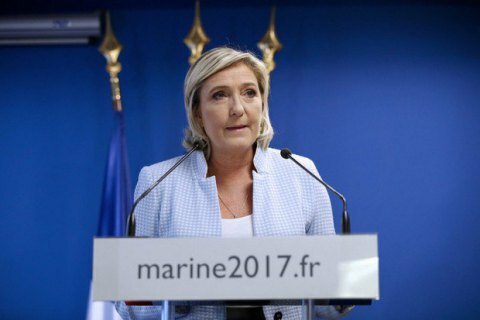 According to recent opinion polls, she is likely to make it to the runoff to face Francois Fillon from the Republican Party. France will hold the first round of the presidential election on 23 April and the runoff on 7 May.